Shadow of War will be out for PS4, Xbox One, and PC on October 10. On Friday, the developers at Monolith laid out their plans for the game’s “Market,” and it’s full of the type of buzzwords that you can only find in AAA gaming. “Through the Market, players can purchase Loot Chests, War Chests, XP Boosts and Bundles (accessed only with an internet connection),” they wrote. • Loot Chests contain Gear (weapons and armor) of varying rarity. Equipping and upgrading these weapons and armor enhance Talion’s character abilities. Loot Chests can also contain XP Boosts that help level up Talion faster. 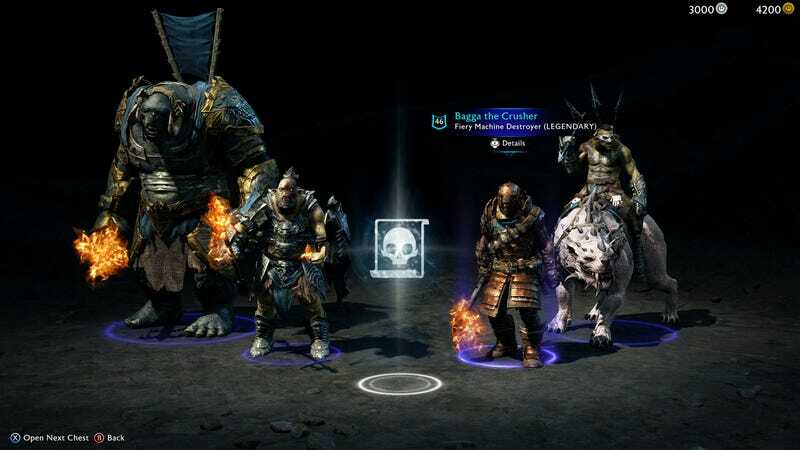 • War Chests provide Orc followers of varying rarity to help forge a strong army. They can also contain Training Orders to level up and customize Orc followers. • XP Boosts are consumables that help level up Talion faster. • Bundles package up Loot Chests, War Chests and Boosts together at a great value. The company says it will reveal the pricing for Gold at some point in the future. Everything a player can buy with Gold can also be earned in the game over time for free, but Gold gives players the option to acquire these items faster. No Gold purchases are necessary to enjoy the complete game experience. It’s one thing when a $60 game offers microtransactions for cosmetics. It’s quite another when the game wants you to pay to cut down on “some of the additional time that would have been spent winning more battles, tracking nemeses, completing quests and assaulting fortresses.” It’ll be impossible to play Shadow of War without getting that nagging feeling that the game is full of padding that you should be paying to avoid. Between this and releasing the game smack in the middle of October, surrounded by the likes of Assassin’s Creed: Origins and Super Mario Odyssey, it seems that Warner Bros. is dooming Shadow of War to a fate worse than Boromir’s.